Mothers Out Front, a Cambridge-based organization with community teams in five states, educates and trains mothers and supporters to advocate and act for a “swift, just and complete” transition to renewable energy. Not a few Cambridge members have gone on to play roles in the growing national movement grappling with climate change through “grassroots organizing, personal and collective action, and a focus on shifting policy.” We caught up with Mothers Out Front Cambridge Community Team Co-Coordinators Zeyneb Magavi (right) and Leslie Bliss (left) at a city park recently. Magavi,a graduate student, has three daughters 12, 11, and 6. Bliss, an educator, also has three daughters, 24, 23, and 21. 1. What makes Mothers out Front different from other organizations working on the global warming issue? Bliss: Since we’re building a grassroots national movement, there’s an emphasis on empowering others and creating leaders. Magavi: Well, it’s run by women and it’s not hierarchical. Bliss: We spend time building relationships with each other—within community teams, and with other Mothers Out Front in the state, across the country, and with allies. We give importance to taking the time to listen, connect, and respect. Another difference is that we are focused on fossil fuel policies as an ethical choice. Environmental organizations have focused, in past years, on love of nature, on trees, etc. ; others focus on the science of climate change. These are important, but Mothers Out Front has a very human focus. Magavi: Mothers Out Front is based on a moral directive—that it is immoral to ruin the climate for our children’s future. A multigenerational Mothers Out Front team flagged gas leaks in Cambridge in May, raising awareness that the leaked methane is 84 times more dangerous than carbon dioxide in the first twenty years of its release. 2. What have you told your daughters about climate change and how have they reacted? Bliss: My kids have heard a lot of talk about it at home and are very aware of climate change. 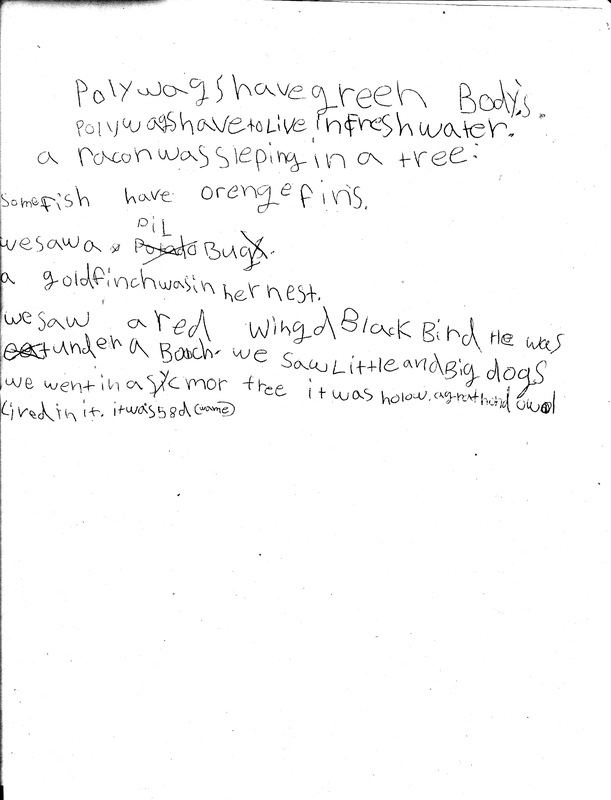 We were chatting with one of our daughters, who dreams of becoming an apple farmer. My husband reminded her that she’d have to look even farther north than New England to be able to do that. Our daughters have been part of mitigating our reliance on fossil fuels in the household. Magavi: I think of discussing climate change with children the way any parent deals with any other parenting problem. It needs to be developmentally appropriate. My oldest two know the “big picture scary part” of climate change. My youngest (6) and I haven’t yet discussed it directly. The first step is to learn to love nature, understand how it works and that is a system. Once you understand that it’s a system, that you can understand more clearly how it can be disrupted by human activity. Also, if you present a problem along with information about an action to address the problem, it avoids the anxiety in young kids. My middle daughter got really worried for a while. I brought her to a march, and her worry went away because she had done something about climate change and saw that other people are working hard on the problem. We’re giving them hope. Bliss: At one point I was gathering postcards and sending them to Governor Baker. My daughter stepped up and said, “Oh, I’ll do that, too, mom.” This sort of thing creates a jumping off point, where you can connect and have a conversation about actions we can take. 3. How do you see the relationship between Black Lives Matter and Climate Activism? Magavi: Both movements fight injustice. Often the infrastructure for fossil fuels extraction and delivery goes geographically through disadvantaged communities. If you step back in time and think of colonialism and the extraction of resources it involved, you can see a parallel, that the fossil fuel economy is being played out in a class way. I’ve read a paper spelling out how inequity is the root cause of climate disruption. The main idea is that only from inequity and huge gap between haves and have nots can you get the kind of extraction and consumption of natural resources that has driven climate change. Black Lives Matter UK recently had a sit-in at the London City airport (editor’s note: The airport is slated for expansion into adjacent neighborhoods). They were drawing attention to the fact that it’s the wealthy who fly in those airplanes, and it’s the front-line communities and the poor who suffer the most as a result of the environmental effects of the air travel industry. Bliss: The No-DAPL movement is a recent example I’ve seen that’s really taken fire, highlighting the connection between injustice based on race and injustice based on climate. (Editor’s note: The “Dakota Access” Pipeline (DAPL) is a fracked-gas pipeline that will stretch from North Dakota’s Bakken shale fields through Lakota Treaty Territory and underneath the Missouri River, to Peoria, Illinois). 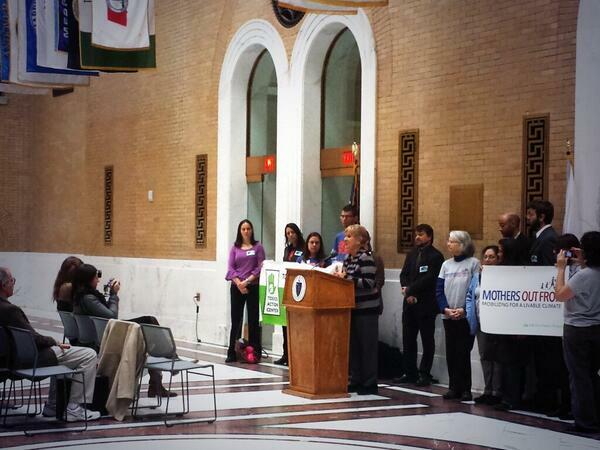 In Massachusetts and elsewhere, Mothers Out Front has campaigned against expansion of fracked gas infrastructure. 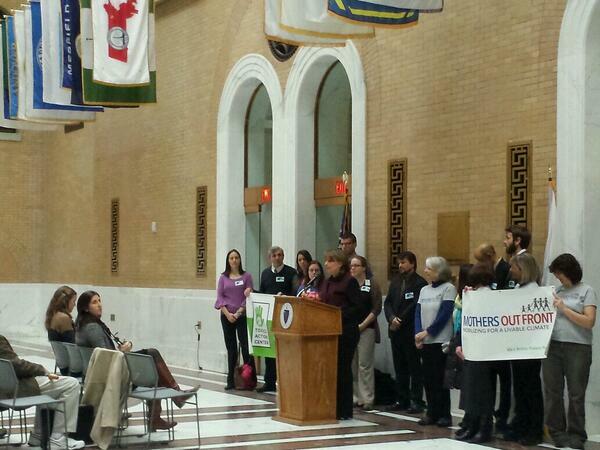 Click here for more information about the Massachusetts Stop Spectra and related campaigns. 4. What does being part of Mothers Out Front mean to you personally? Bliss: We’re pragmatic and get things done one step at a time—that’s how parenting is, too. I’ve come to know know I’m not alone in being concerned about this. I have built strong relationships with other women in Mothers Out Front who are part of our Cambridge team. This has been deeply motivating and reassuring. Magavi: I would second that. I would also say what’s been inspiring is the strength and brilliance of the women in the group. The way we work is so low stress. We work collaboratively —it’s a pleasure. It means a lot to me to take action on climate change through Mothers Out Front because it turns worry into a positive, meaningful action. The Cambridge City Council unanimously passed a resolution supporting Mothers Out Front’s gas leak campaign in May. 5. What does a member do? Can people who aren’t mothers join ? Magavi: With Mothers Out Front, you can participate at any capacity you are able to do—from ‘liking’ the Mothers Out Front Facebook page to volunteering at a table at a community event. You can volunteer when you have free time, and then not, when you don’t. We’re mothers, so we understand about time constraints. Categories: Cambridge, Massachusetts, Climate Change | Tags: Cambridge, climate change, dapl, global warming, Mothers Out Front, spectra | Permalink. Today my twelve-year-old daughter and I joined hundreds of men, women and children at Brayton Point, a coal-fired power plant in Somerset, Massachusetts. We were with Mothers Out Front and 350.org; we were with an angry mother from West Virginia coal country; we were in a community that deserves not to be the seat of protest, but rather the locus of hope that a radical turnaround in the use of fossil fuels could bring. Indeed, it’s the economic predicament of towns like Somerset and coal towns in Appalachia that seem to give my daughter the most pause. It’s the feeling of imposing, even intruding, on a community, that made me balk, even as I walked and shouted in view of the plant. There were a few protesters who voiced their support of the Somerset community to the onlookers whom we assumed to be local. called out one, passing a teenager with two adults (and a dog) who stared at the procession en route. However weak the delivery, however it may have raised more questions than answers, that sentiment was–is–right. And if it’s not right up front, and backed with deeds, not pledges, then this isn’t a transformation that’s going to have wings. I’ll trade you those for the lead boots of political pandering and the duplicity of coal companies any day. We’re tired, and a bit dehydrated, but with much more to say later about our experiences. Stay tuned for profiles of some of the people we met in the shadow of the power plant today. Meanwhile, my twitter feed will give you a window on our day of outrage and incredulity that coal still plays a role in our power supply. Categories: Climate Change, Environmental Activism | Tags: 350.org, Coal, fossil fuels, kids, Mothers Out Front, parenting | Permalink. It’s time for me to leave the sidelines. It’s time for slow this-and-that. Slow Food. Slow Families. Slow Medicine, even. Unplug. Be in the moment. Pay attention. But to what? Wait a minute, what was that last one? Should that even be on my list at all, even at the bottom? See, I think, in all of this urgency to be “slow” and to return to the basics, something else basic is missing. Not something, two things. You can’t be “Slow” if you’re trying to make ends meet. Not slow in that aged cheese, hand-packed lunch for the kids sort of way, not if getting to work, keeping up with bills or getting work is out of reach. You can’t be “Slow” if it’s a shortcut to the sidelines. 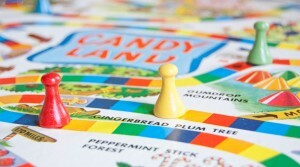 In Chutes and Ladders, and in Candy Land, you have NO CONTROL over your destiny. Are these the games we want our kids to learn? Because they need to learn the cardinal rule that you have NO CONTROL over whether you get socked with the “Plumpy” second-rate hard candy or end up shacking up with “King Kandy” at the Candy Castle. Off Trail in the Peppermint Forest. Who needs a path when the path that’s been charted by others leads to malaria in northern climes? I like aged cheese and hand-canning and growing my own parsley just as much as the next person (on the cheese front—maybe more, sorry to say). But as I’m bushwhacking through the vines of parenthood (think Little Shop of Horrors) and feeling sorry for myself way too often for the emotional and physical ramifications of being a “mature mother”—a phrase I never use even in my own head because it’s simply an awful euphemism, but I’ll use it now anyway because SLOW JOURNALISM at this moment means just-in-time-ranting, aka unedited and unexpurgated and the mature mother thing is an epithet—I’m unable to lop off that very last thing with my wicked cool mom-ninja-machete. That last thing on the list is so—I don’t know, so—overwhelming as to be farcical. It’s like World Peace. Yeah, I’m going to work for world peace—by grabbing my kids who are screaming and trying to maim each other over something someone took from someone else’s room when the rule is you can’t go in someone else’s room without permission. No, that last thing had to do with global warming, had to do with not only the messed-up politics in the country but the entire economy and actually the entire planet. Mother Earth. I wonder what her list looks like. Categories: Climate Change | Tags: activism, children, climate change, climate progress, economic justice, environment, environmental justice, fossil fuels, global warming, mothers, Mothers Out Front, nature, parenting, social change, social movements, working mothers | Permalink.